We had been to Edward I’s statue in Burgh-by-Sands at the end of our previous section, so we began this one with a visit to the memorial marking the place he died. 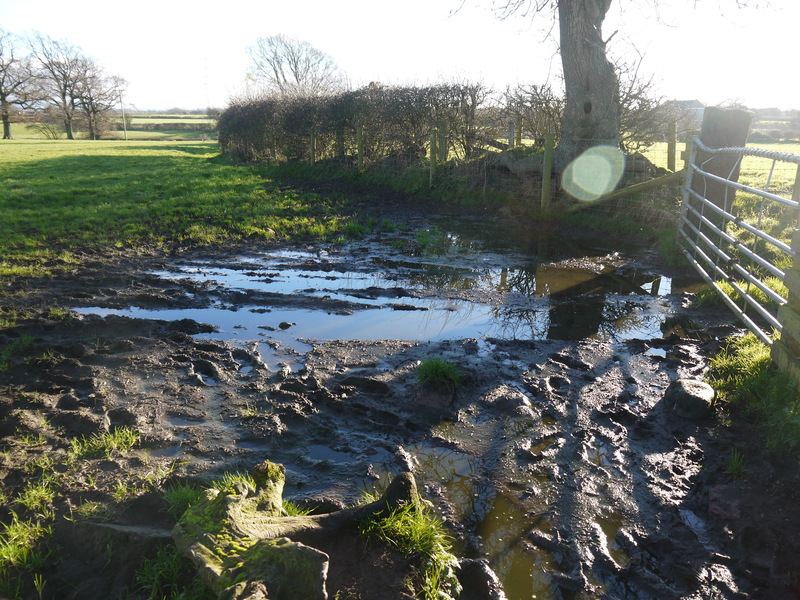 This was a short walk along a farm track then over a stile and across a field with a submerged track flanked with mud, then another stile onto the Burgh marshlands which were actually drier than the previous field had been. I reflected on what had occurred here and its effects on history. 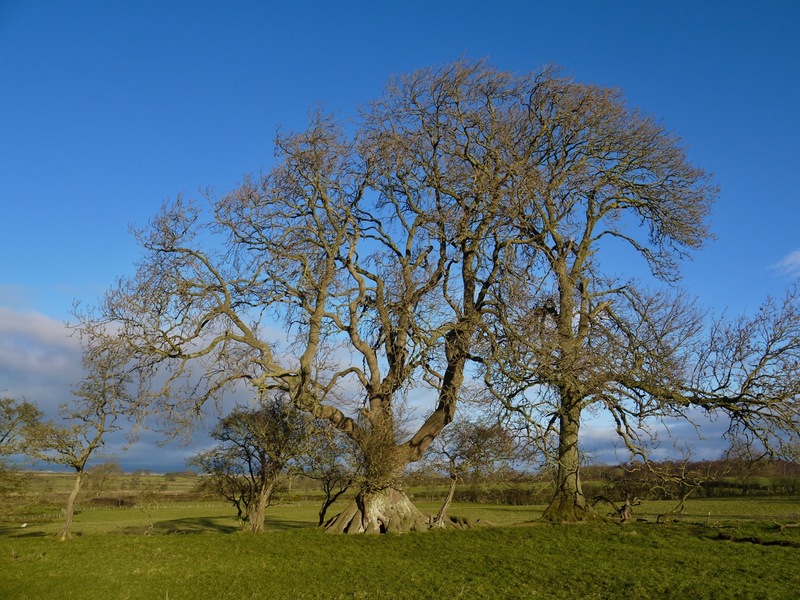 “At daybreak on 7th July, 1307, in his camp on the shore north of Burgh by Sands he was unable to go into battle again and while his attendants were raising him to give him food, his life expired.” So died the mighty Edward I, Longshanks, looking out across the Solway, prepared, despite dysentery, old age and failing health, to make one last assault on the rebellious Scots. His body “lay in state” in Burgh by Sands church and then in Carlisle Cathedral before it made its long journey to Westminster abbey and its final resting place.” (S Matthews). One wonders why he chose to camp here on the marshes rather than the higher ground of Burgh itself. The monument was indeed restored in 1803 and this is recorded on one of its brass plaques. It was larger than I had expected, as you can see in the photograph below. J.W. in the extract above says the monument was 25 feet tall. The only other record of its size was from about the same time and stated it to be nine yards and half in height. Looking at my photos I’m inclined to believe the latter estimate. There are two inscriptions on brass plaques, both in Latin. Then it was back to rejoin the Hadrian’s Wall Trail just past Burgh. We had a very brief walk along the road and then through an HW acorn-marked gate and along a grassy path to cross a small footbridge. From here we were walking along the route of The Wall itself, though we wouldn’t have known had it not been marked as such on our maps. A line of trees stand along the route now. Another gate led us onto another grassy path between high hedgerows that took us all the way to Beaumont, which I am told is another shibboleth, being pronounced locally as Beemont. 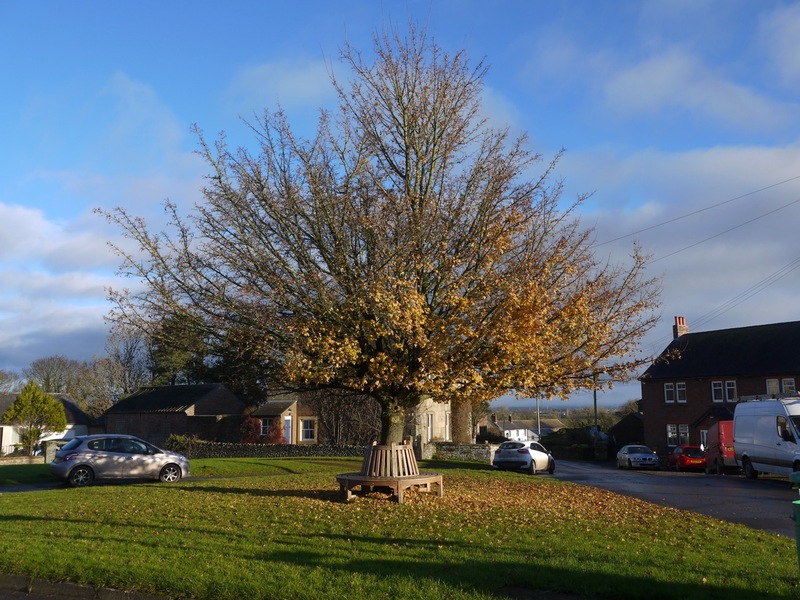 Beaumont is a small village with a triangular village green. A tree with a surrounding seat stands on the green and would have done nicely for lunch if our timings had been different. St Mary’s church stands on a small hillock and an information board show how it had once been part of a fortified village that would have included the green. 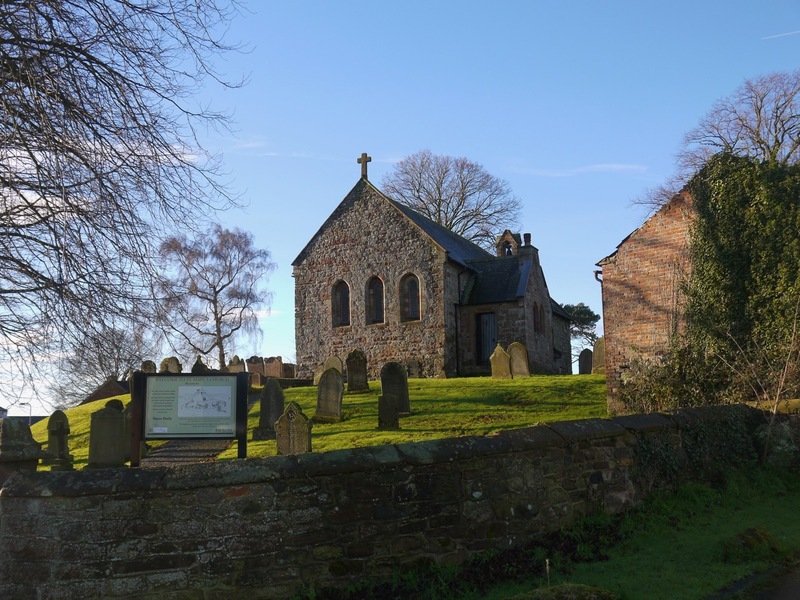 The church was built in 1296, likely using stone from Hadrian’s Wall. Wikipedia says the church has two local traditions for weddings. The groom cuts a string tying the church gates shut, bestowing good luck to the couple; and a piece of rope is stretched across the road where wedding cars can pass only if they give money to the children. Beaumont is a quiet secluded village now but this was not always so. From the village roads lead north to the ancient waths or fords across the Eden. 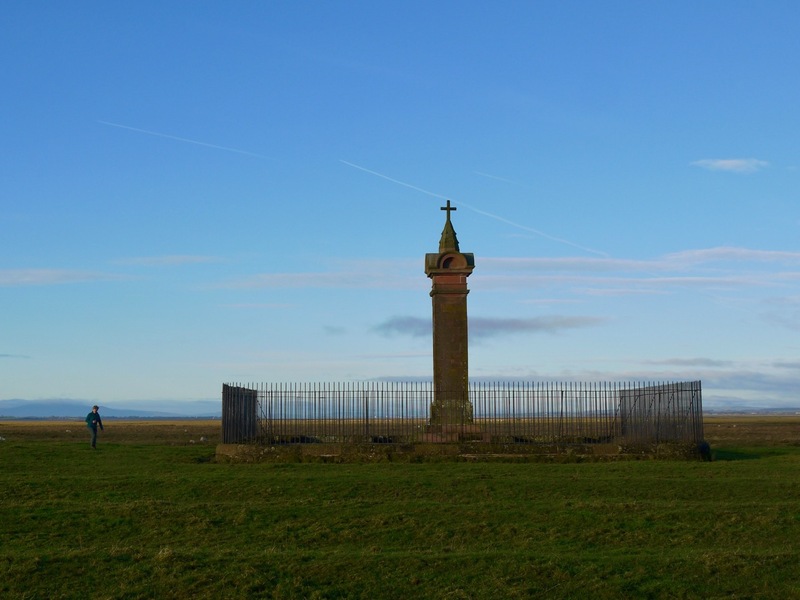 One, the “Stony Wath” is at Sandsfield, not far from King Edward’s Monument. Another the “Peat Wath” is opposite Castletown House. A third the “Rockcliffe Wath” is a little below Rockcliffe Church. A traveler who crosses the Eden from Beaumont by the Waths meets a road, believed to be the oldest in the district, which was a highway long before the Romans. From Rockcliffe this road runs northwest to the Wath over the Esk, and finally goes to Gretna. Until 1816 this was actually the road from England to Scotland. Beaumont would have seen Edward’s army on the nearby marshlands in 1307. His body was carried through Beaumont en route to Carlisle and then London and only a few years later in 1322, his enemy, Robert the Bruce’s army camped in Beaumont for five days returning from raids that had penetrated as far south in England as Chorley. It was here in Beaumont that we first heard of various closures of the HW trail and suggested detours. A sign informed us that the HWW’s riverside path beyond here was closed due to a landslip. We took the suggested detour to Kirkandrews-on-Eden, along the minor road parallel to and about 60m from the actual path. 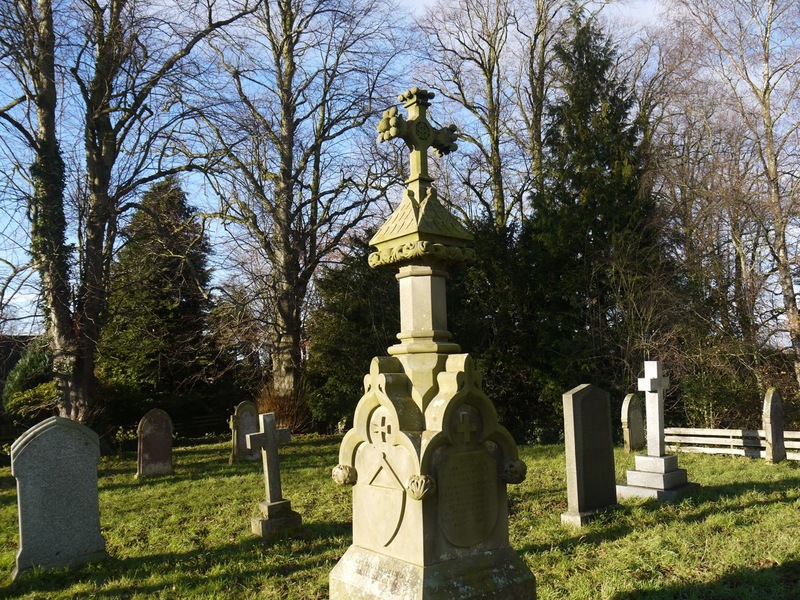 The cemetery in Kirkandrews-on-Eden has an impressive gravestone that caught our attention and drew us towards it. It stood much taller than the old stones about it and I was expecting the name of some local lord, but it marks the grave of Olivia Mary Margaret, ‘wife of the perpetual curate of Grinsdale’. A little delving reveals that Olivia Mary Margaret Ostell was born in Calcutta, where her father ran a bookshop, in 1833. She returned to England with her father following the death of her mother in 1836 and was brought up by relatives at Moorhouse. On May 22nd, 1856 she married the Rev. John Burton Norman, the perpetual curate of St. Kentigern’s church, Grinsdale. But the couple had only a year together, Olivia died in 1857. 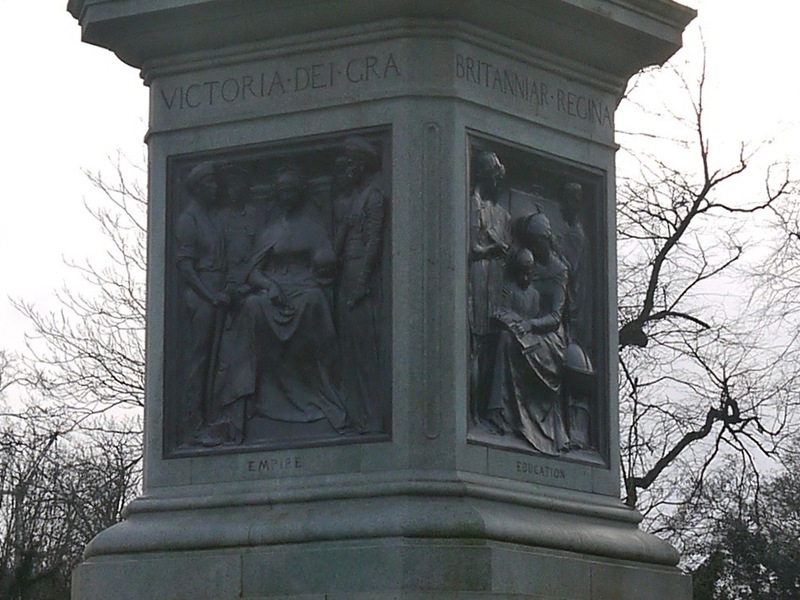 The impressive memorial erected by her husband would later inspire a local author, Ann Robinson, to write the book “Olivia Mary Margaret: a rectory Childhood”. 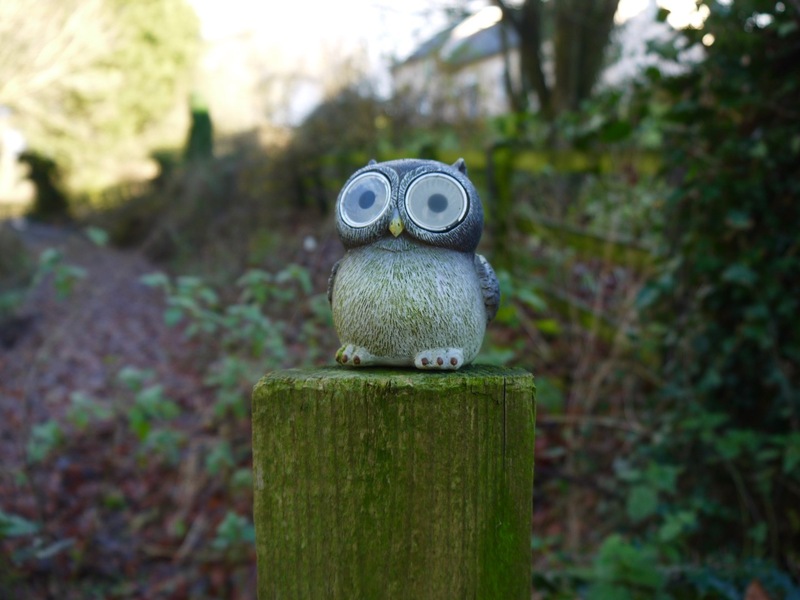 We rejoined the HW in Kirkandrews where we found a little owl on a gatepost. I though it looked familiar at the time but couldn’t put my finger on it. Now I know why it was familiar. Could it have been the original inspiration for Tripadvisor’s logo? There was a rope stretched across the path, with length of orange string hanging from its centre, presumably to increase its visibility. (Feedback to whoever put it there: you might want to try harder). We lifted the rope, navigated our way through some mud and stepped through a gate from path to even more mud. We made our way along at the foot of a natural rise following the route of the actual Wall once more. Unfortunately it was both muddy and slippery. I trod into some deep sinking mud but managed to get through with just a muddy leg. But my attention was soon drawn away from the muddy leg as I heard a brief squeal combined with a wet splat behind me. Audrey’s footing had proven unsure and she was both able to twist her knee and get a closer look at the mud. 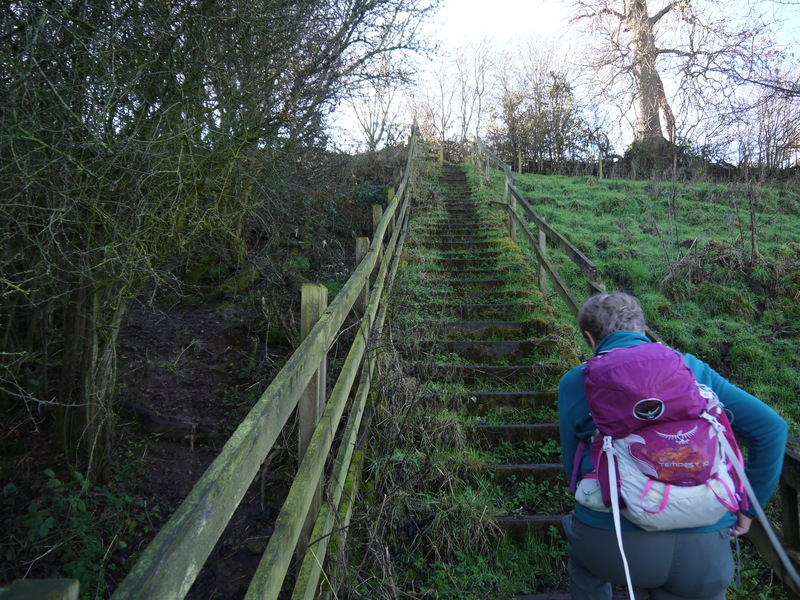 After a period of reflection on the ills of muddy trails we pressed on and got to firmer ground, then up some wooden steps onto higher ground. The grassy ground up here was less muddy, at first. But between there and Grinsdale we had more mud to cross and boggy grass to skirt about. Grinsdale was the next village after which we were then expecting a riverside walk for the rest of the day. We walked on in sunshine, admiring the views, with me keeping track of our position on the map. Then we walked beneath a major road, which wasn’t on my map (The Harveys Hadrian’s Wall Route Map). This had me worrying that we had strayed somehow but we soon realised that the map must have not been updated since the Carlisle By-pass was built. The By-pass was opened in 2012 and I bought my map in 2017. 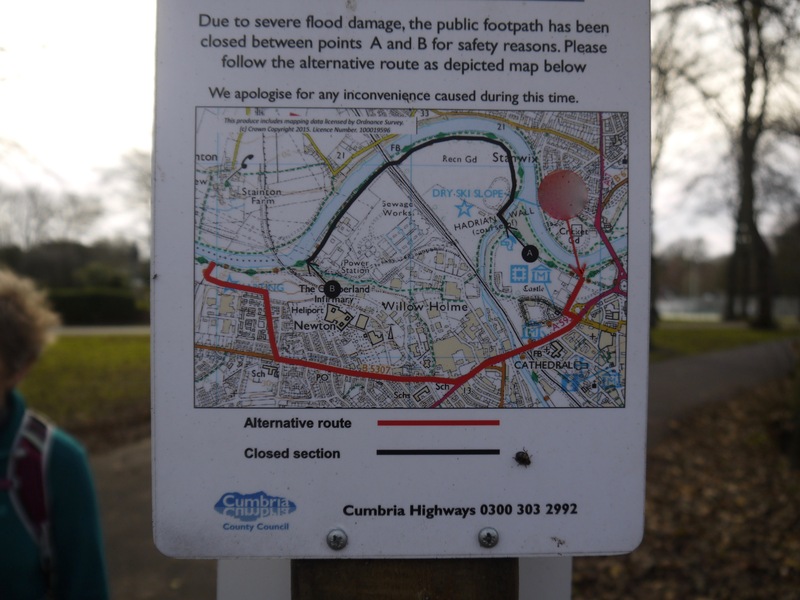 Unfortunately, not long after passing beneath electricity pylons, and by some steps down to the riverside we came to a sign informing us that the next couple of miles of path were closed due to ‘severe flood damage’. The alternative route suggested was along main roads, so was not particularly appealing to us. After a little discussion, we decided to press on along the HWW. If we found the route to be impassable or dangerous we would find an alternative way. There did seem to be some other footpaths on the map. As it turned out, the closed section of path was undamaged, and we passed several other walkers/runners and dog-walkers, presumably locals, using the paths. The route was absolutely fine all the way, much of it on cycleway type paths. We even stopped at a picnic bench for our lunch. The problem was that a construction site blocked our way onto the bridge across the River Caldew. It would have been easy to leave a way for walkers but quite a bit of effort had gone in to preventing access. We tried making our way around the fences but found ourselves within a tall fence around the athletics track. So we retraced our steps and tried a wider route around and were then able to walk across the bridge. 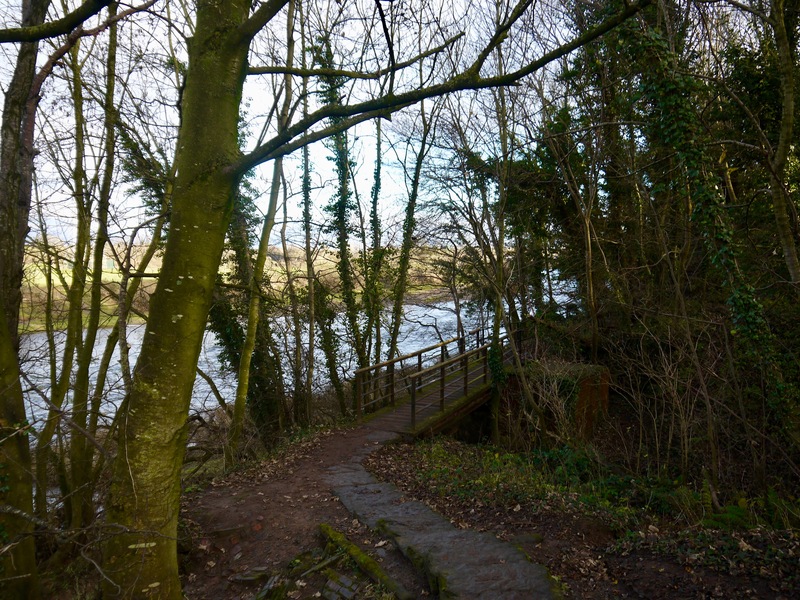 The path took us into Bitts Park, adjacent to Carlisle Castle. The sun was behind the castle so my photos didn’t really do it justice. 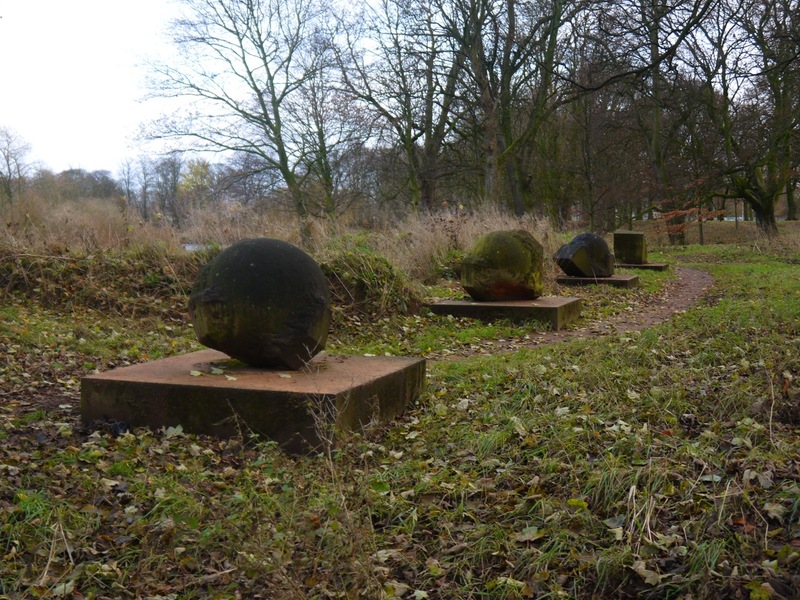 We were intrigued by four large rocks on stone plinths in the park. These looked like remnants of some larger Ozymandias type statue, and I wondered if they were all that remained of some great Roman monument. But it turns out they are an art installation, ‘Toward the Sea’ by Hideo Furuta. The Eden Benchmarks website describes it thus: “The four components of this sculpture are manifestations of the sculptor’s intense and mathematical explorations of the stone itself and, almost incidentally, describe a sequence of water eroded stone running parallel with the flow of the river nearby“. 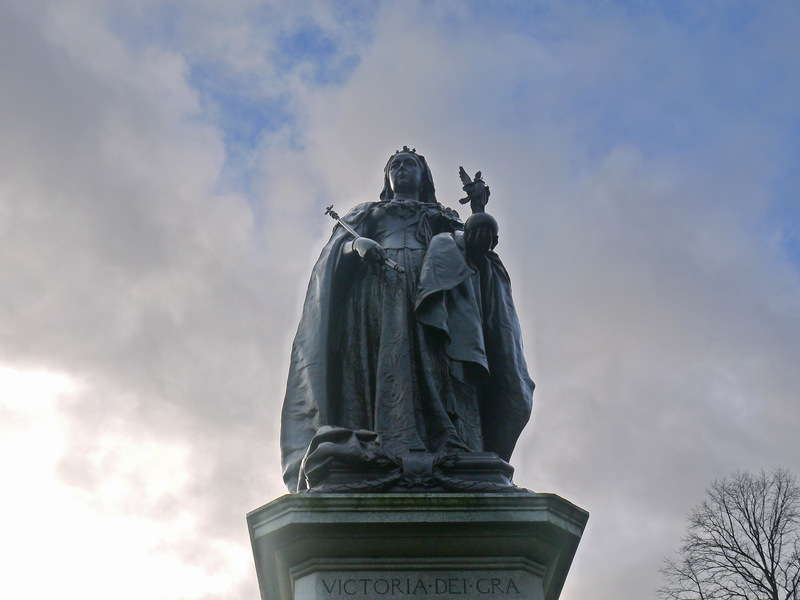 Born May 24th 1819, Died January 22nd 1901.
of her noble life and character. The park when opened in 1893 had been called the Peoples Park but was later extended and renamed The Bitts. The ‘Bitts‘ in the name are small parcels of land used for grazing. In the park we found a sign about the third path closure but this was not too taxing. Rather than walking along the southern bank of the Eden we were to cross on the road bridge and walk along the northern bank and into Rickerby Park. We walked in a ginnel beneath the A7 where a sign on bridge showing the level the water had reached in the flood of 2005. I turned to look back and realised how much land had been underwater. 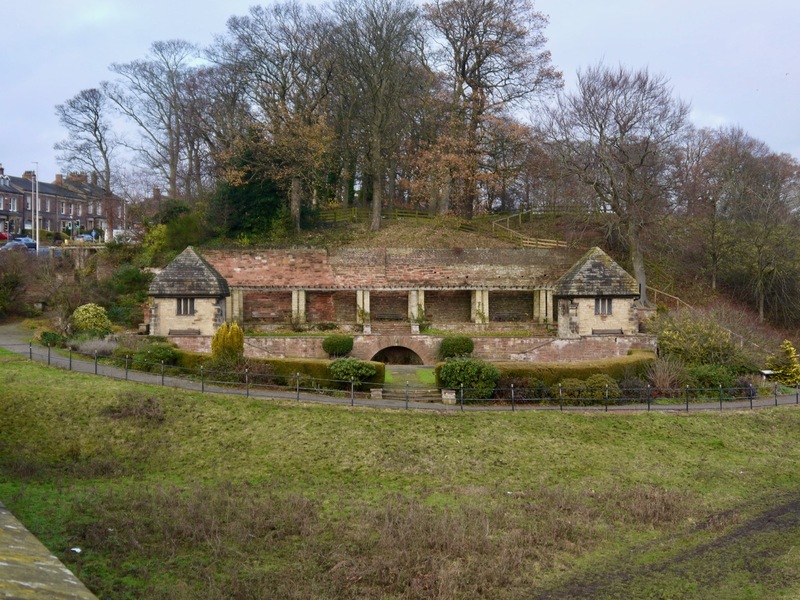 We crossed the road bridge and walked down a few steps into Eden Bridge Gardens then along a footpath through Rickerby Park. A grey heron standing by the path reminded us of the watery nature of these fields. 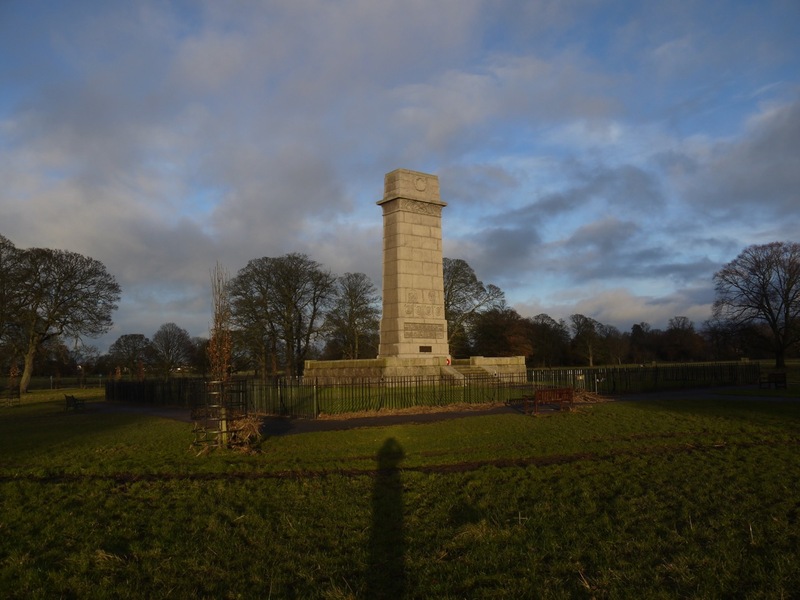 Rickerby Park has an impressive War Memorial as shown below as well as the Standing Stones pictured at the top of this entry. 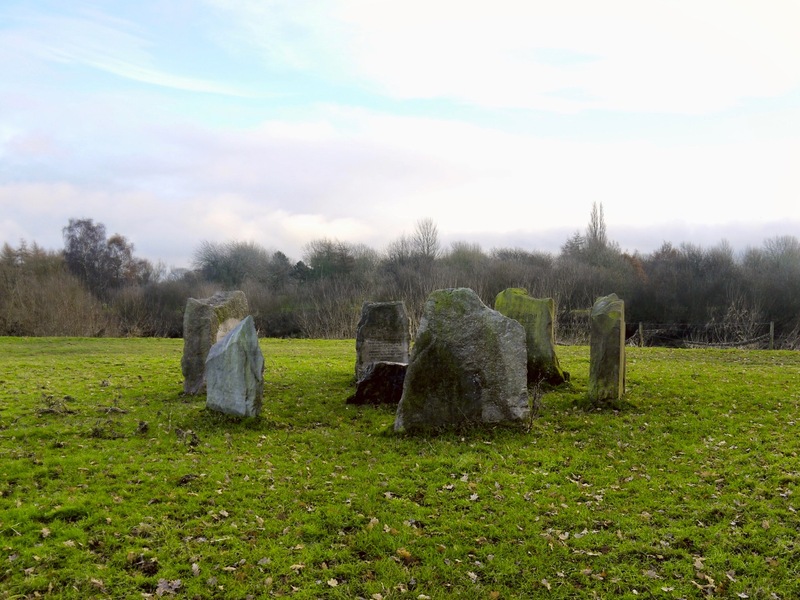 This stone circle is a collection of the different rock types found in Cumbria; Penrith Sandstone, Millstone Grit, Limestone, Kirkstone Slate, and Shap Granite, with information about how and where it formed and where it can be found.